Scopri numerose attrazioni veneziane in un unico itinerario con questo tour di un'intera giornata. 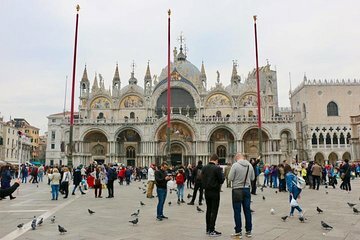 Visitate Piazza San Marco, la Basilica di San Marco e il Ponte di Rialto con una guida storica dell'arte che ha aperto la strada. Passeggia lungo i romantici canali di Venezia e sali a bordo di una gondola per un giro panoramico in barca. Dopo il tempo libero per il pranzo, salta la fila per accedere immediatamente a Palazzo Ducale per vedere la cella della prigione di Casanova e attraversare il Ponte dei Sospiri. Wonderful intro to Venice. The guides were friendly, and knowledgeable. We learned a lot and afterward felt comfortable navigating the city. Highly recommend this tour. We had a wonderful tour guide. We were fortunate to be the only 2 people on the tour, so it was just a private tour. Our guide was very knowledgeable and we enjoyed every minute of her telling us of the history and background of St Marks square and Doge’s palace. Highly recommended. The gondola ride was amazing too! I think I fell in love with Venice thanks to this tour. Both our guides were great. In the morning, we visited St Mark's, had our gondola ride and also walked around Venice exploring the small streets and pathways. Our guide was very knowledgeable and shared a lot of interesting facts. She didn't tell us only the dry history, she presented it an a way that made it intriguing. It was the same in the afternoon. The Doge's Palace tour was a little bit long but definitely interesting. I loved learning a little bit more about Casanova and how he explained. It was also great sneaking through the secret passages. So much fun. Only thing I would say is that it would've been better if we were moving around slightly faster. The slow walking just tired me more and by the end of the second tour I was exhausted.